To ensure Taxi Rank abuse by private and commercial vehicles is acted upon, at the next compliance meeting can United Cabbies Group, The London Cab Drivers Club, The London Taxi Drivers Association, The RMT and Unite Cab section, request that TfLTPH demand the enforcement of Taxi ranks by Local Councils and not pass the buck onto individual Taxi drivers to report! Every day the working Marks & Spencer rank at North Wharf Rd is completely taken over by goods vehicles. We asked TfLTPH to please go down there and arrange with the council to have this vehicles removed.....this was their 'passing the buck' scripted reply! Standings for hackney carriages to be appointed. It shall be lawful for [F1Transport for London] from time to time to appoint standings for hackney carriages at such places as they shall think convenient in any street, thoroughfare, or place of public resort within the metropolitan police district, any law, statute, or custom to the contrary thereof notwithstanding, and at their discretion to alter the same, and from time to time to make regulations concerning the boundaries of the same, and the number of carriages to be allowed at any such standing, and the times at and during which they may stand and ply for hire at any such standing, and also from time to time to make such regulations as [F1Transport for London] shall deem proper for enforcing order at every such standing, and for removing any person who shall unnecessarily loiter or remain at or about any such standing; and [F1Transport for London] shall cause all the orders and regulations to be made by them as aforesaid to be advertised in the London Gazette, and a copy thereof, [F2signed by a person authorised for the purpose by Transport for London], to be hung up for public inspection in [F3the offices of Transport for London], and at each of the [F4magistrates’ courts acting for an area falling wholly within an inner London borough]; and such copy shall be received in evidence in the said courts as if it were the original of which it purports to be a copy, and shall be taken to be a true copy of such original order or regulation, without further proof than [F5the aforesaid signature]. That tells me and a court of law that TfL are liable for enforcing order at the ranks, and removing any person unnecessarily loitering there. TfLTPH refused to comment further. 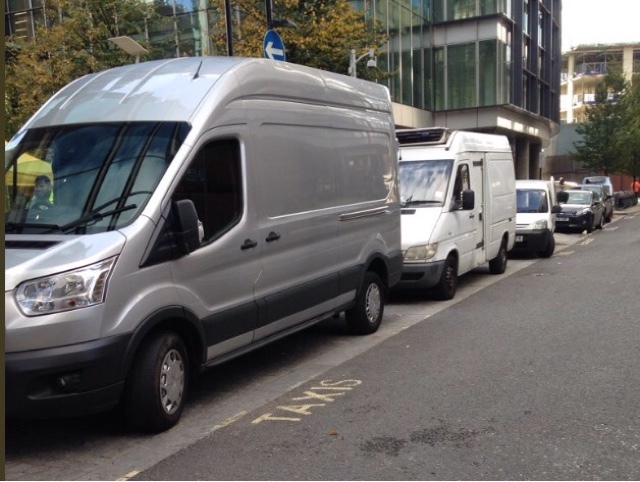 Cars and other vehicles parked on taxi ranks can be reported to the relevant borough, or to TfLTPH if the taxi rank is on a red route, so action can be taken. Compliance meetings with the trade are a regular event, yet very little content from these meetings seems to make it into the trade media. 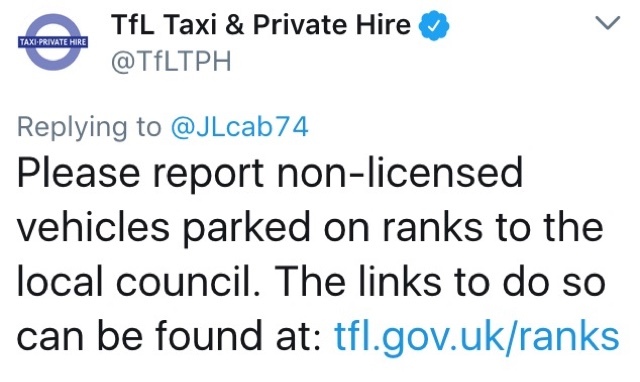 Taxi Leaks would like to take this opportunity to offer unlimited space on the blog to any org who wishes to post an article to the trade, regarding any meeting with TfL. Let's have no more secret squirrel meetings with our regulators. Let's get the message out there to the rank and file driver.